AMSTERDAM is a beguiling capital, a compact mix of the provincial and the cosmopolitan. It has a welcoming attitude towards visitors and a uniquely youthful orientation. For many, however, its world-class museums and galleries, notably the Rijksmuseum, with its collection of seventeenth-century Dutch paintings, and the Van Gogh Museum are reason enough to visit. Amsterdam was founded on a dam on the river Amstel in the thirteenth century. During the Reformation it rose in stature, taking trade away from Antwerp and becoming a haven for its religious refugees. Having shaken off the yoke of the Spanish, the city went from strength to strength in the seventeenth century, becoming the centre of a vast trading empire with colonies in Southeast Asia. Amsterdam accommodated its expansion with the cobweb of canals that gives the city its distinctive and elegant shape today. Come the eighteenth century, Amsterdam went into gentle decline, re-emerging as a fashionable focus for the alternative movements of the 1960s. Despite a backlash in the 1980s, the city still takes a uniquely progressive approach to social issues and culture, with a buzz of open-air summer events, intimate clubs and bars. The Albert Cuypmarkt is arguably the best-known and busiest outdoor market in Europe. It attracts thousands of visitors every day, and is especially popular on Saturdays. There are over 300 stalls and goods range from fresh produce, to clothes, to odds and ends, with prices among the cheapest in Amsterdam. The market is located in the Pijp district, surrounded by many pleasant cafes and small shops. There is another number of regular street markets in Amsterdam. Right in the center of Amsterdam, you can also find the oldest Zoo of Holland. It consists of four main areas: Zoo, Planetarium, Botanical Gardens and Geological and Zoological museum. In the zoo itself you will find animals from all over the world. In addition, a unique canal aquarium shows you which animals roam the canals of Amsterdam. The planetarium offers children a trip trough the universe. In the peaceful gardens, you can find many old trees and statues of contemporary artists and aswell as an impressive, tropical rainforest greenhouse. The Geological museum shows you how the planet has evolved over the past 4 billion years. Unlike the climate suggested by 17th-century landscapes depicting half-frozen skaters, Amsterdam has a temperate maritime climate with cool winters and mild summers. The best time to go is May (when the tulips are out) to August, when the weather is most reliable, but an Indian summer during September and early October can be delightful. Rain is spread evenly over the year, often in the form of endless drizzle, though the statisticians tell us that most of it falls at night (yeah, right). It’s best to bring a foul-weather jacket in case of the occasional cold snap or rainstorm. Very few hotels have air con­ditioning, although higher temperatures due to global warming are slowly forcing a change. December to February is the coldest period, with occasional slushy snow and temperatures around freezing. It rarely freezes hard enough to allow skating on the canals, but when it does, the city comes alive with skaters. And you couldn’t wish for better photo material than Amsterdam after a dusting of snow. The Netherlands uses the euro (€). If you’re coming with US dollars you’ll be aware that the euro has appreciated sharply against the dollar in the past couple of years. As for the denominations of the currency, there are €5, €10, €20, €50, €100, €200 and €500 notes, and €0.01, €0.02, €0.05, €0.10, €0.20, €0.50, €1 and €2 coins (amounts under €1 are called cents). Euro notes are the same in all participating countries: coins have a ‘European’ side and a ‘national’ side (in the Netherlands, with an image of Queen Beatrix). All are legal tender throughout the euro zone area, although many businesses will not accept notes larger than €50 because of the funny money in ­circulation. 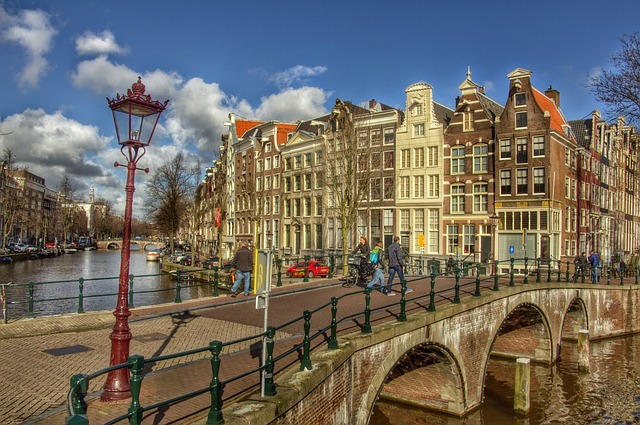 Amsterdam is the city of antiques, books, diamonds, and curiosities. In general, shop-opening hours are 1-6pm on Mondays and 9/10am-6pm Tuesday to Friday. Most have late night shopping on Thursday until 9pm, and close earlier on Saturdays, at 5pm. Some supermarkets, like Albert Heijn stay open until 8 or 10 pm. On Sundays, you can shop in the city center, Kalverstraat, Damrak, Leidsestraat, and near the Noorderkerk. First off: Nieuwedijk-Kalverstraat, about 1 km full of shops. This pedestrian area, there is no traffic other than a constant stream of tourists, students, scholars, excursionists and locals. The Nieuwedijk is close to Central Station and basically dedicated to clothing, sportswear, music and gift shops with that special Amsterdam vibe. The road leads to Dam Square. 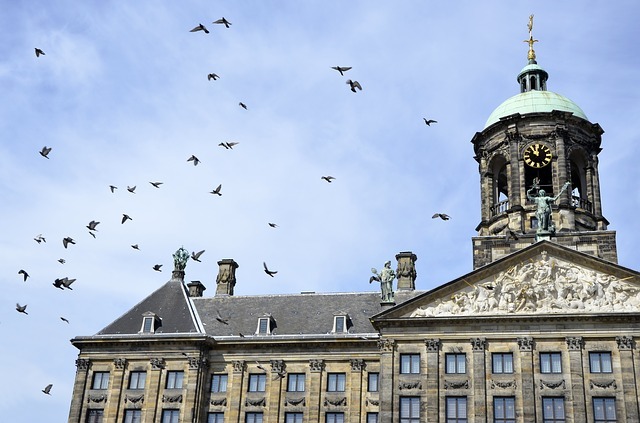 Around this square you will find the Royal Palace, the Nieuwk e Kerand Madame Tussaud’s. Citizens of Australia, Canada, Ireland, New Zealand, the UK, and the US need valid and current passports to enter the Netherlands and to re-enter their home countries. The Netherlands does not allow entrance to Americans, Australians, Canadians, and New Zealanders whose passports expire in under three months; returning home with an expired passport is illegal and may result in a fine.